In the last few months I have been going back to my change and organizational development roots. I have been on a journey to reconnect my more recent insights on systemic change and innovation systems with my earlier experience in process consulting, supporting organizations to change. I have rediscovered many old ideas that are still extremely valid and useful. I even have to wonder how I forgot some things that once were so important to me. Also, some things that did not seem all that important 10 years ago now seems far more important, but I digress. Let me share an example of how a more recent insight about innovation became more powerful when I looked at it from an organizational development perspective. 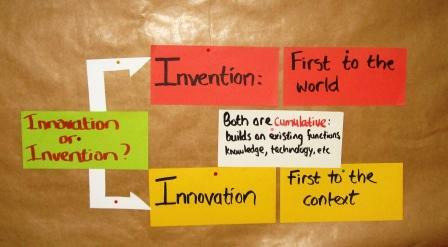 In my training work on innovation systems, I often lay a foundation with some simple concepts. One such building block is the idea that there are three kinds of innovation: product, process and business model. Product innovation is the easiest (you need to mainly be creative, know something about either a key technology or a key market), with process and business model innovation often being more difficult because you might need more abstract thinking capability, technical and others skills from beyond your organizations as well as a creative imagination. Easy enough, all the participants nod their heads in agreement and indicate that I can move on. Yet, back at the office this was not so simple. I noticed that a few of my favorite technology and R & D centres here in South Africa were struggling with this very simple idea. They were mainly focused on product innovation, arguing that their behavior is shaped by the incentives created by public grants that supported them to develop products for wanna-be entrepreneurs (I wrote about the importance of technological capability here). It was convenient to blame the public grants for this incentive, and everybody knew that the results less than ideal (many of these wanna-be entrepreneurs did not stand a chance in the market as they lack technological capability and or business experience). Thus the Status Quo was maintained with everybody talking about changing but not really making the shift. Until the easy funding became less easy. It was at this point that some management teams realized just how entrenched the culture of product innovation was, and how dependent these organizations have become on public grants. So I had the task of coaching a team to think through this change process, to reduce their dependence on public funding by helping their team to shift to process innovation from a mainly product innovation focus. This meant that instead of designing, prototyping and manufacturing a particular product for a wanna-be entrepreneur, they shift their attention to helping existing companies or entrepreneurs with a track record improve, enhance or expand their process technologies so that they can themselves develop, prototype and manufacture new products. Interestingly enough, the technological capabilities for product innovation and process innovation for this particular engineering group have a lot in common. It is mainly the internal processes, arrangements of teams, self assessment criteria (are we making progress?) and the identity of the organization that had to change to make this shift. This in itself meant some business model innovation was required. They also had to become better in forming partnerships with other technology providers. In complexity thinking language, the physical technologies and entrepreneurial technologies will remain largely the same, but many additional or different social technologies would be needed. For instance, some additional skillsets are needed that are more expensive and not typical to technology centre at universities. Lastly, this process focus shift would require far more work on the premises of the client, and also working with many other unknown technologies and sectoral requirements, which meant that concepts such as self-management, temporary work teams and many parallel projects also had to be tried out. It started sounding more and more like a completely new organization and a major disruption that this client could not afford. Starting over was simply not an option. And the individuals in the current team was a real asset. If this team could not make this shift then very few would be able to make it. It was agreed that we needed an adaptive process, a series of small experiments that allowed them to try some process innovation applications. The horizons of innovation provided a useful framework (Tim Kastelle inspired me about this model, recently Ralph-Christian took it further). We captured their current technological and market capabilities and agreed that this focus had to be maintained while we find ways to explore the adjacent technological and market spaces without breaking the bank. Tim Kastelle always say 70% of the focus should be on the current block (horizon 1). We did this by first looking which process innovations would be interesting to some of their existing markets (we found a few). The we looked at where their current technological capability could be used in new markets, but in a process innovation way. This could be done by investigating some economic sectors a little deeper. Thus most of the energy of management remains on the current technological base and markets, with an additional focus on process innovations in an adjacent markets and technologies. We were all surprised that these ideas required very little additional funding (at first), with more specialized equipment and skills required if any of these ideas took hold. The moral of the story is this. It sounds simple to say “shift attention from product innovation to process innovation”. People might actually agree this is important. But to make this shift requires many internal changes. A process of exploration and mental simulation using a simple framework was all it took to identify some areas where the current management team with its current resources could try several new ideas, without much change to the business plan or operations of the organization. I am very pleased with this outcome. Thanks to the team for trusting me to facilitate this process. You know who you are! I want to continue the “Instigating Innovation” series (see opening post here, where to start and the post about culture here). The idea behind this series is that I explain innovation management concepts that can be used by both enterprises and technology transfer and industry support institutions. Just to recap. I believe that many industries are struggling to modernize because their supporting institutions use completely different frameworks to manage innovation (or perhaps the supporting institutions make their choices as randomly as enterprises do). One of the first technologies that a tech transfer institute or industry support organizations should transfer to enterprises is “how to manage innovation and technology”. Just because there is an engineer or an MBA/PhD in a company does not guarantee effective or creative management of innovation and technology. Today I want to focus on the four broad functions that must be managed strategically in every enterprise and supporting institution. Even if someone in the organization has the job title of Innovation Manager or Technology Manager these functions should still be visible throughout the organization. In other words, this is not somebodies job, but it helps if somebody coordinates these activities. When I visit institutions, organizations and companies, I always ask “who is thinking about change taking place beyond your industry or key technology?”. I cannot tell you how often I hear that “the CEO” or “production manager” are on top of new developments and will be attending a tech fair next year. How can this huge responsibility fall on the shoulders of one or two people, who are at the same time biased towards the current strategy and that favors justifying past (sunk) investments? Or ask “How did you choose between two technologies?” and you will be surprised how little time was spent considering new business opportunities, or how few companies asked for onsite demonstrations or samples from their preferred technology providers. I will refrain from being too critical of technology transfer institutions and industry supporting organizations, except to say that these organizations should be a prime example to industry of how to scan, evaluate, compare and integrate new ideas and technologies. We don’t just want to see the shiny machines and neat facilities, we want to understand how you arrived at your decisions, and how you made the best of your investments after implementing the change. Furthermore, industry wants to know what is next, or what is outside of their vision and how it may affect their industry. To bring it all together, technological upgrading of industries are plagued by many different market failures. These failures include the tendency NOT to invest due to high search costs, due to fears about making the wrong choices, or because so many decisions and changes must be made at the same time. This while the business continues, markets fluctuates, and technologies change faster and faster. Companies (and institutions) cannot afford to only kick start innovation management just before making a change (or when forced by external forces to make a decision), these functions must be managed strategically on a continues basis, both at the level of top management and within the different functions of the organization. Both companies and their supporting institutions need to manage innovation and technology, not only from an operational perspective (striving for continuous improvement, etc) but also from a strategic strategic perspective. Reflecting on the correspondence I have received after my previous post and recent training sessions with manufacturers, I realize that people are looking for tools and tricks to “fix” innovation. Sometimes it is actually not even about innovation, but about making up for past decisions like not investing in technology or market development when they should have. Others think of innovation as a function, or as a management tool that can be standardized into a job description or an area of responsibility. While this is possible in some contexts, I don’t find this approach to innovation so useful in the smaller and medium sized manufacturing firms and the research/technology institution space where I am working in. For me, innovation is firstly a value, perspective on how organizations should be. When management says “we are an innovative organization” or “we want an innovative culture” or “our reputation is that we are innovative” then we can move to tools, portfolios, tricks, and tweaks (those things that people in innovation functions must attend to). Many textbooks, articles and blog sites on innovation and technology management are then useful. Actually the challenge is to decide which of the bucketloads of advice to use, and consultants like me typically help organizations to choose a few tools and to then use them consistently and fully. I would dare to say that it is relatively easy to help companies that are already innovative to become more innovative. The area that I am really intrigued by, are those organizations that are not innovative, or that would not describe themselves as having an innovative culture. Maybe they used to be innovative. Maybe they are innovative in some areas, but not in others. Maybe they had one or two tricks in the past that have now become old. These could be extremely competent organizations, like a research programme, a manufacturer of highly specialized industrial equipment, or an organization that simply design and manufacturers what their customers expressively tell them to make. Even if the outputs of these organizations can be described as “innovative”, these organizations themselves do not necessarily have innovative cultures that constantly are creating novel ideas, processes and markets. In my experience these organizations have technically brilliant people, but management is often not able to harness the genius, experience or creativity of their people. The main reason for this is not a lack of technique, tools or tricks. It is because of a lack of an innovative culture, leading to a lack of innovative purpose. These organizations are trapped. They are equipped for the past, but they are paralyzed by all the choices they have to make about the future. For management, it feels like everything that they have in place are inadequate and need equal attention, ranging from attracting staff with better (or different) qualifications to finding new markets, developing new technological capability, sorting out cash flow and capital expenditure, addressing succession planning, etc. 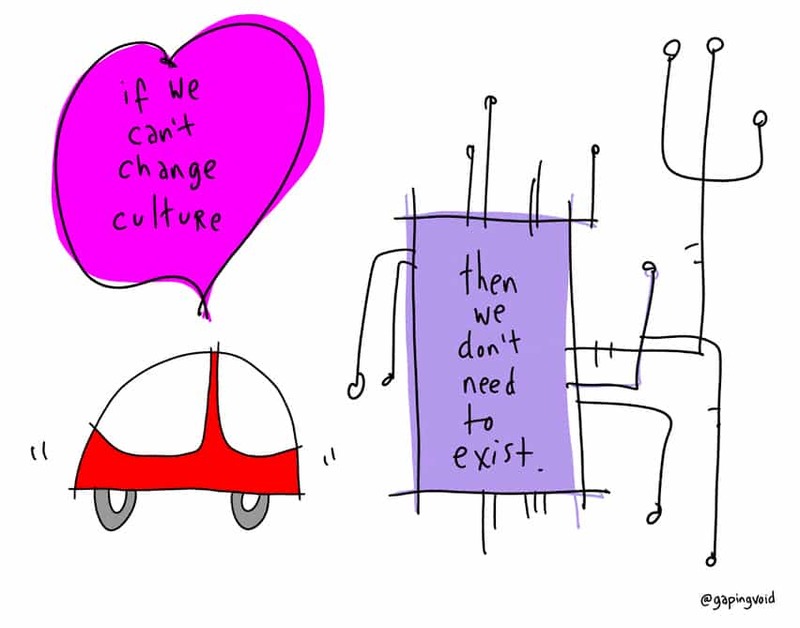 Improving the innovation culture of an organization is a complex issue. It is not about tasks, functions or tools, but about changing relations between people, within and beyond the boundaries of the organization. When working with organizations that must improve their innovative culture, motivational speeches, optimistic visions of the future, etc, are not useful and could in fact deepen the crises facing management. Instruments such as scenario planning, roadmaps, foresight techniques, or interventions like starting a R&D unit, a lean exercise to reduce waste, are all addressing the wrong issues and distract management from confronting the real issue that are stifling the organization. It narrows the ability of management and specialists to scan within and beyond the organisation for opportunities that could be used to change the way people work together, think together, solve problems together. The typical employee in a manufacturing or technical environment loves solving problems, love tinkering with novelty. But often management becomes so performance or target obsessed (lean?) that they don’t tap into the latent potential of their people. Improving the innovation culture process starts with connecting management back with their people. It starts in the present, the now, not the future scenarios, not with using innovation techniques, better analytical tools, and in most cases not with some or other management fad. It goes beyond trying to improve products, processes or business areas, beyond gaps in the management capability. It must look at the relations between people, between what people know and can do now (or in the recent past), and the potential the people see to make small improvements. When management has the courage to decide to improve their innovative culture it starts a process that cannot be described as incremental improvement, as that sounds too directed. It is rather like a deepening, or an awakening where employees are inspired to contribute, and management is more aware what they can do to enable their employees to become more innovative on all fronts. Of course, management also face the risk that outdated management approaches that does not seek to empower employees to be creative will be exposed, and some tough decisions will have to be made. For me the most promising approach to improving innovation in an organization is a organization development approach (not limited to design, not based on technical innovation instruments) based on complexity thinking, like our Systemic Insight approach. We are using instruments such as Sensemaker developed by Cognitive Edge to find areas for improvement, areas where relations between knowledge objects (knowledge, artificats, heuristics, etc) and people can be improved, starting from where the system is and then probing to understand what the immediate potential is for improvement. It allows people to take many small steps in parallel to improve the system and to push back the boundaries that have constrained the creativity in the organization. In my view, building an innovation culture goes far beyond establishing or refining innovation management functions. It is a strategic issue that is initiated by top management, but that will soon spill over into every area of the organization, hence it cannot be driven from a management function like “innovation”.